Pakistan’s legendary ghazal singer Abida Parveen is honored with Lifetime Achievement Award by Kaladharmi Begum Akhtar Academy of Ghazal in India. 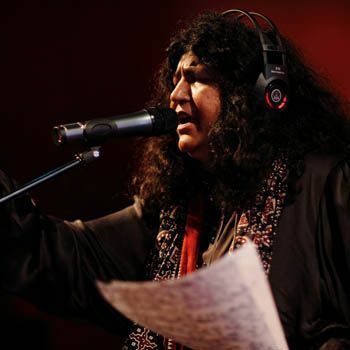 Abida Parveen is known as the Queen of sufi music worldwide, with her singing forte of kafis, ghazals and qawalis. She has sung a number of super popular ghazals such as Duma Dum Mast Qalandar, Yaar Ko Hamne Ja Ba Ja Dekha, Tere Ishq Nachaya, Jabse Tumne Mujhe, Latthe Di Chadar and the ever hit Lal Meri Pat rakhiyoun bhalla jholay lalan. She has been awarded with Pride of Performance and the Sitara-e-Imtiaz by the Government of Pakistan and recently, received the Lifetime Achievement Award in India. During the award ceremony she also performed her most spell bounding ghazal Lal Meri Pat rakhiyoun, on her fans request. We congratulate Abida Parveen for achieving Lifetime Achievement Award.